When is a new album not a new album? When it’s not a new new album, I guess, but a new old album, seen for the first time in the reflection of a distorted Funhouse mirror. ‘Milking The Stars’ is a spin on last year’s ‘Last Patrol’ album, although it’s neither a remix nor a remake, lying in the nebulous, grey area betwixt the two. Monster Magnet’s Masterblaster Dave Wyndorf describes it as “a re-imagined version of ‘Last Patrol’ featuring four new songs and live tracks. It's not a re-mix record by the current definition. It's more like ‘Last Patrol’ in a what-if style alternate reality. What if these songs were recorded in 1968? What would happen if I turned a pretty song into an angry one? How would adding creepy organs and Mellotrons affect the emotional vibe of a song?” How indeed. From the off ‘Milking The Stars’ appeared an intriguing concept, and the resulting homage to its progenitor takes the original album to star systems it could only dream of reaching. So the closing riff of ‘Last Patrol’ is spun into the seven instrumental minutes of ‘Let The Circus Burn’ (a clip from the original song’s lyrics), ‘Paradise’ is re-worked into ‘No Paradise For Me’, and ‘End Of Time’ becomes a keyboard-swirling Doorsy workout which it’s impossible to listen to and sit still at the same time. Groovy, mama… The only real loser is ‘Hallelujah’ which, now reconfigured as ‘Hallelujah (Fuzz And Swamp)’, sacrifices the stomp for sheen and doesn’t benefit for its make-over in the slightest. That’s a minor gripe though, and the storming passion of ‘Goliath Returns’ more than makes up for any shortcomings elsewhere on the album. And if that’s not enough, the album’s capped off with live recordings of ‘Last Patrol’ and ‘Three Kingfishers’ taken from a show at the AB Club in Belgium earlier in the year and which feature the debut of new bassist Chris Kosnik. 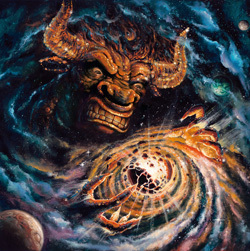 I’ll freely admit I’ve always had a soft spot for Monster Magnet, but in ‘Milking The Stars’ Wyndorf and his fellow galactic adventurers have really come up trumps with a imaginative and innovative twist on what was already an exciting album and in doing so have released what I consider to be the best record of 2014. Simple as that.